Summer Savory Pancakes. Yum!! 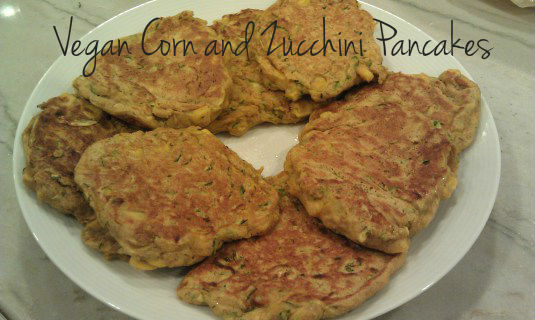 Corn & Zucchini are such amazing and versatile summer veggies. Love chickpea flour!! So super high in protein and such a great binder. It works great in pancakes & burgers. These pancakes were deelish! Very savory and had that sweet corn bite as well. The kiddos had lots of fun with them too! 1. Preheat a griddle or large saute pan over a medium flame. Spray or rub it with coconut oil—just enough for pancake making. 3. As if you were making regular pancakes, drop the batter by 2-tbsp servings onto the griddle, and wait until the bottom side is nicely browned. Flip, and cook till second side is browned.